To be entirely truthful, (as compared to partially truthful), few things in the world are as cool as the study of rocks. Particularly Sedimentary rocks. Like Judy from "What's Up Doc?" I share the sentiment that "I can take your igneous rocks or leave 'em. I relate primarily to micas, quartz, feldspar. You can keep your Pyroxenes, magnetites and coarse grained plutonics as far as I'm concerned." As such, the field trip we took to Arches National Park was most exceptionally engaging. The different formations we saw tell of the history of the Earth, and within Arches, of the Mesozoic period of time. It's like the ultimate time machine, but without having to wear the bulky safety suit! Off to dino Land!!! One of my favorite parts of the whole trip was our journeying through the Fiery Furnace (which was aptly named btw.) Within the Fiery Furnace we saw that in the Entrada layer of Sandstone, there were streaks of white sandstone within the red. This was like, seriously cool, because for my research paper I had written on groundwater bleaching that had taken place within the Navajo Sandstone, and I realized that the same general processes that had taken place within the Navajo had also taken place within the Slickrock Member of the Entrada. As acidic groundwater (pH 4.8 or less) had travelled through the sandstone, it removed the iron oxide coating that coated the individual quartz grains. In this picture we can see bleaching that has taken place from groundwater. 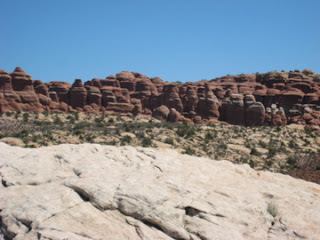 In the front is the Navajo Sandstone, which is bleached. In the back is the Entrada Sandstone, and on the right side you can see a layer of white stone within that layer. Cool huh? Fact. In sum, Geology is boss. You should all major in it. The trip was fantastic, and I learned a whole lot! But aside from the academic aspect of it, we also had so much fun! We went to Rock shops, and somersaulted down sand dunes. Good times. So, why was the Navajo bleached and not the Entrada? Hmmm. This was like, seriously cool, because for your research paper that you had written on groundwater bleaching that had taken place within the Navajo Sandstone, and you could not realized that the same general processes that had taken place within the Navajo had also taken place within the Slickrock Member of the Entrada. Groundwater Testing makes up about twenty percent of the world's fresh water supply, which is about 0.61% of the entire world's water, including oceans and permanent ice.